We’ll arrange a convenient time to meet in the comfort of your own home, so you don’t have to run around town visiting showrooms… wasting your valuable time. Our Professional Kitchen Designers are always on time, and value your time. However, if for any reason we’re not there exactly on time… we’ll hand you a crisp $50 note on the spot, for wasting your time. No questions asked. Next, we discuss your personal requirements. Our Designer will work with you to understand how the people in your home use your kitchen, how much storage you need, the types of appliances you want to add (or keep your existing ones)… plus, much more. Everything is considered down to the smallest detail… so that your new kitchen is 100% unique and a perfect fit for you and your family. Your Designer will also bring along samples of colours, bench top materials, door profiles and surface choices. Everything, plus more than you would find in any kitchen showroom can be sampled, touched, visualised and chosen in the comfort of your own home. You can know exactly what you’ll be getting and see how it all comes together without leaving your current kitchen space. After you have chosen and decided on your new kitchen design and finishes, your Designer will go away and work diligently on layouts and drawings of your kitchen so you can see exactly how it will look. They’ll prepare a detailed proposal and quote, based on everything you discussed, chose and decided. Within a week, they’ll be ready to return to you and present their comprehensive proposal, specifying every material and component in transparent detail. There’s no surprises, you’ll know exactly what you’ll be getting… and unlike other dodgy companies, there’ll be no smokes and mirrors to make you sign and pay a deposit on the spot. Of course, if you’re happy you can choose to move forward straight away, or if not, we can work with you to make changes to your design and specifications until you are 100% happy and ready. Either way, there’s no pressure to proceed. It’s your decision, and it’s completely up to you what you would like to do next. We don’t believe in high pressure sales tactics… we let the quality of our work and our commitment to detail to speak for itself. The reality is, we will provide you with over $600 worth of custom Planning, Design and Selection work for your new kitchen, absolutely FREE! Your professional service from start to finish and willingness to find solutions for some tricky requests were the main reasons we chose you. We have been delighted with the service and were kept informed all the time. Any extra requests we made were met with a positive response and you just made it happen. Why Choose Easy Living Kitchens? How Come Your Quote & Design Consultations Are FREE ? Unlike a number of our competitors we don’t charge a fee for design consultations and quotes. You deserve to have the freedom to choose who you trust to design and supply your new Kitchen before you start handing over your hard earned money. We believe once you discover the value, benefits and guarantees we can offer you (that our competitors can’t) there’s a good chance we’ll be doing business together anyway. No pre-commitment required! What Areas Do Yo​u Service? We currently service the Greater Brisbane area from Caboolture to Logan and Ipswich to the Bayside. Of course, we often get referrals through past customers for properties outside this area and will do everything we can to meet those requests. Simply call us and we will help you where we can. I'm Very Busy... How Can I Be Sure You Will Even Turn Up To The Consultation? Don’t you just hate it when you make appointments with a company and they don’t turn up on time… if at all? I know we do. That’s why when you make an appointment for a Easy Living Kitchens Design Consultant to visit your property, we GUARANTEE you won’t be left waiting or wondering. $50 On Time Consultation Guarantee – we Guarantee you will never be left waiting for us if we have made an appointment with you for a quote. If on the rare occasion something goes wrong and your Design Consultant is behind Schedule and you don’t get a notice call at least 1 hour prior to your appointment, then even if they are just 1 minute late to your scheduled appointment, they will hand you $50 on the spot, no questions asked. How Soon Can You Come And See Me? Easy Living Kitchens friendly and experienced designers are industry leaders and in high demand; luckily we have large team of hand selected specialists and can normally come out to see you in your home within 2 -3 days of your call. Why Should I Use A Professional Kitchen Designer? Your kitchen is the heart and soul of your home, and should make your lifestyle easier PLUS add value to your home. Only a friendly Easy Living Kitchens Designer, who has the knowledge and expertise to listen to you and understand your individual needs and visions, can advise you on how to make the best use of the space in your kitchen. Your designer will create a unique, functional and stylish looking kitchen for you and your family that is practical and incorporates clever storage solutions that will last a lifetime. You only get one shot, so you need a specialist who designs kitchens day in day out to ensure you haven’t wasted your hard earned money. It's a false economy to do your kitchen on the cheap. There is so much to take into consideration when designing a new kitchen and way too many choices and decisions to make, so don’t risk it with just anyone as the last thing you want is a kitchen of poor quality, looks and functions badly and actually devalues your home. Only Easy Living Kitchens friendly, creative and experienced designers can simplify the process for you giving you all the information, sharing with you all the options and possibilities to make your kitchen beautiful and your experience hassle free. Yes can rest assured that Easy Living Kitchens creative designers are the best in the industry. We've seen pretty much every scenario, combined with over 35 years in the industry and a vast range of experience to tap into. No job is too tricky or challenging. You will get a custom designed and well crafted kitchen that cleverly makes use of the available space and looks and feels just right… We are very experienced in this area and you will be amazed at our ideas! I Just Want To Replace The Doors & Bench Tops Only... Can You Still Help Me? No sorry we can’t help you for a couple of reasons. One is we only manufacture and supply complete full new personally designed kitchens and bench tops and are not set up do makeovers like this. The second reason is, it’s a false economy because the carcasses will wear out and are actually the cheapest part of your Kitchen. So you are spending good money to replace doors and tops to save just a little bit of money and once the new bits go in the carcass will look old and second hand, plus the new on old never fits real well either. Our advice, save a little more money and get then lot done, you will be so glad you did. Otherwise there are small little cabinet makers or handymen that may do it for you. I'm Want To Renovate My Kitchen So I Can Sell My Property... Can You Help? Yes we can, we can design a kitchen with that objective in mind, understanding that you want to improve the resale value of the property without going overboard and what the market is looking for. Best of all, it will also have that WOW factor too so it will appeal to prospective buyers. Yes Easy Living Kitchens will help you choose which appliances best suit your needs and lifestyle and give you options to suit your vision and budget. With relationships with some of the best brands in the world you can rest assured Easy Living Kitchens has taken care of everything for you and will make sure they are ready and on site for your installation. If you already have your appliances, that’s ok as we just need to make sure they will work in the new kitchen design so make sure you have all the specifications ready when we arrive…. Easy Living Kitchens recommends not buying any appliances until you have designed your new kitchen. Yes, there have been many horror stories with imported kitchens being made with carcinogens, falling apart, completely wrong sizes, not meeting Australian standards and no chance of getting warranty repairs done… the list goes on! Our best advice is simply don’t risk your families safety or your home by buying Imported Kitchens. 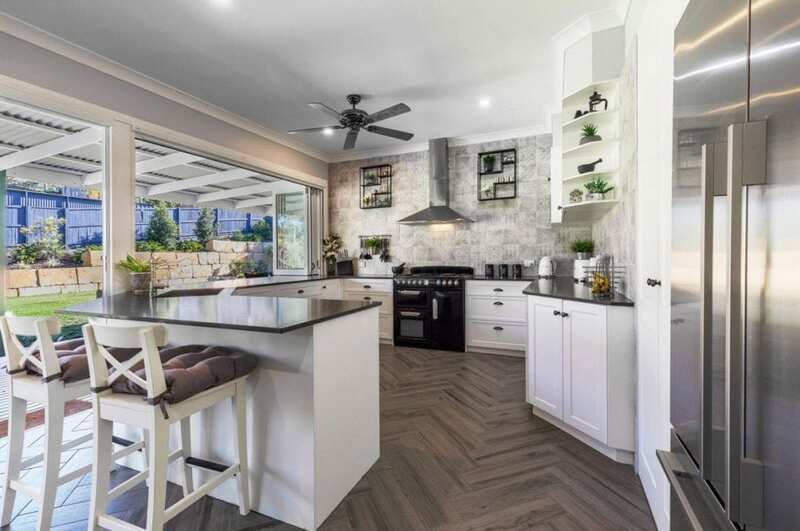 Easy Living Kitchens manufacture all our custom-made cabinets in Brisbane supporting local jobs and families and are delivered fully assembled to you. Best of all, our suppliers all have a commitment to eco-friendly and sustainable processes. How Long Will My Kitchen Renovation Take? This will vary depending on what’s involved like stone bench tops and glass for splashbacks among other things. But as a general rule of thumb it’s suggested that you allow for 2-4 weeks from start to finish. Will You Just Quote Me A Price, Then Hit Me Up For Extras Later? Unfortunately, this practice is rife in the industry. Many companies or contractors will deliberately price low to win a job, then use cleverly worded clauses in their contracts to justify substantial costs for variations and extras. 100% Unconditional, No Hidden Extras, Fixed Price Kitchen Supply Guarantee – Even if we find we have left something out in your kitchen design, you don’t pay any more. What you signed off on is what you’ll get and the quoted amount for the supply of your new kitchen is all you’ll pay… GUARANTEED!!! Of course, if you make any changes to what is quoted or add any extras beyond what is included in your quote, what you pay may change.